If you’re one of those people who have tried and tested almost all acne products, then you know exactly how frustrating clearing acne from your adult skin can be. Aside from the fact that most of these products don’t work, a lot of them can really be expensive. In case you’re on the search for products that can deliver results without breaking the bank, then our list of the best drugstore acne products can surely help you out. Neutrogena Oil-Free Acne Wash Daily Scrub can prevent breakouts by deeply cleansing your pores. It has microbeads to gently exfoliate dead skin cells and excess oil. Although effective in doing its job, we recommend that you use the product with caution as it has salicylic acid. It may also not be a good idea to use the product excessively to avoid excessive oil production. St. Ives Apricot Scrub, Blemish Control also has salicylic acid. On top of this, it has apricot extract and walnut shell powder as well. If you have extremely sensitive skin, we suggest testing out the product on a small area of your skin first. Aside from its scent, there are a few people who find the scrub too harsh for the skin. 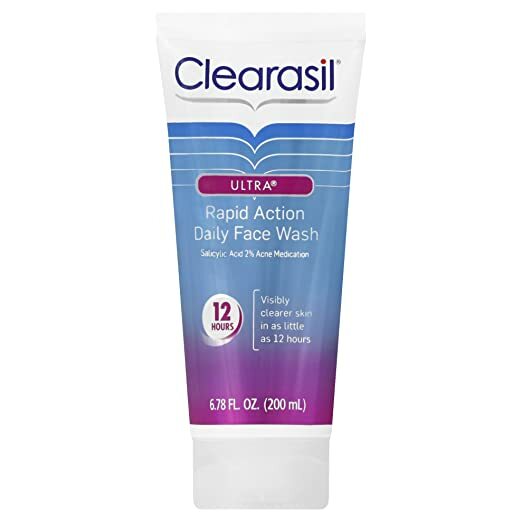 If you are looking for a cleanser that can dry up pimples real quick, then you should try Clearasil Ultra Acne Treatment Daily Face Wash. It's formulated to make your skin visibly clearer in less than a day. We like that it can effectively cleanse your skin even if it doesn't have exfoliating beads. We also like that its scent isn't too overpowering. Compared with the previous products, Clean and Clear Continuous Control Acne Cleanser, on the other hand, has Benzoyl Peroxide. Because of its active ingredient, bleaching of towels and clothes should be expected. Although great in controlling breakouts, this cleanser can cause irritation on sensitive skin. However, when used on the right skin type, it can help you achieve a clearer and moisturized skin without the greasiness. Burt’s Bees Natural Acne Solutions Targeted Spot ﻿﻿Treatment is great to use if you want to tame breakouts real fast. It contains natural solutions, including tea tree and calendula extracts on top of its salicylic acid content to dry up acne in just 48 hours. We liked that the product can also help improve acne scars. Two things to note about the solution, however, is its runny consistency and overpowering scent. For people who frequently wear makeup, getting Yes To Tomatoes Blemish Clearing Facial Towelettes can be a wise move. Because it can remove makeup and excess oil, it can prevent your skin from breaking out. Since it has natural ingredients and only 1% salicylic acid, this product can be safe to use on a daily basis. Its rough texture and powerful smell, however, are two things we don't really like about the product. In case you're having a hard time solving your back acne problems, then we suggest PanOxyl Bar. It has benzoyl peroxide to dry up pimples and prevent further breakouts. This product contains 2% salicylic acid to effectively control acne. It deeply cleanses your pores to prevent clogging and breakouts. It also contains microbeads to gently exfoliate dirt and oil without leaving your skin dry. Because of these properties, this scrub can ward off acne formations before they even begin. For best effects, it’s recommended to use the scrub twice a day. However, it’s also important to use the product with caution as over exfoliation can lead to excessive production of oil. Because it has salicylic acid, it’s recommended that you test the product first for sensitivity. It’s also a must that you use a quality sun block as the scrub’s Alpha Hydroxy Acids can make you prone to sunburn. Users like that the product makes their skin soft and smooth after use. They also like that it costs cheap. On the other hand, there are people who didn’t like that the scrub contains microbeads. There are also some users who don’t find the product strong enough. This product is hypoallergenic and oil-free. It contains apricots which are known to be rich sources of antioxidants as well as vitamin A. While most people think that it has plastic microbeads, the scrub actually has walnut shell powder to exfoliate your skin. To get the most out of the product, you can use it up to three times a day, provided that your skin doesn’t show any sensitivity reaction to its salicylic acid content. Users like that it leaves their skin feeling refreshed and clean after use. They also like that aside from preventing breakout, it also helps reduce the redness on their skin. Some people with sensitive skin who have tried this scrub didn’t experience any adverse reactions from using it. They didn’t even experience any drying effect. There are, however, a few people who find the scrub too harsh for their skin. There are also people who aren’t fond of its scent. For us, we particularly like that the product comes at an affordable price. With its low cost and effectiveness, we’re considering this scrub a must-have product for people with acne-prone skin. This cleanser is specially formulated to help you get clearer skin in 12 hours by unclogging your blocked pores. It removes dirt, oil and bacteria to stop acne even before they form. Users of this product find its quick results to be helpful. The redness and size of their pimples dramatically decreased after using the product. Despite not having beads, this cleanser can still leave your face smooth and clean. It has a creamy consistency that won’t dry your skin. As for its scent, it has a minty fragrance. Although the product has a scent, it isn’t overpowering to the point of causing great concern among users. In fact, a lot of them even describe the scent as pleasant. In contrast, however, there are people who find the formula not enough to completely address their acne. There are others who experience more breakouts after using it, particularly those with extra sensitive skin. 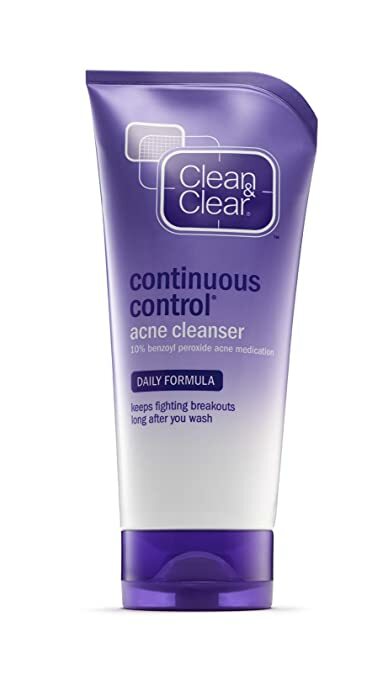 Clean and Clear Continuous Control Acne Cleanser has 10% Benzoyl Peroxide to stop and prevent breakouts. Aside from removing oil and dirt from your face, its anti-acne formula is also able to penetrate and deposit itself deep in your skin. Compared with the tons of anti-acne products on the market today, this one isn’t over drying to the skin. The consistency is very thick. Some users were able to see noticeable results in just weeks of trying out the cleanser. They were satisfied that aside from clearer skin, they also felt more moisturized without the greasy feeling. After use, you’ll notice a tingling sensation. If you have highly sensitive skin, we recommend that you skip this cleanser as it can cause irritation. 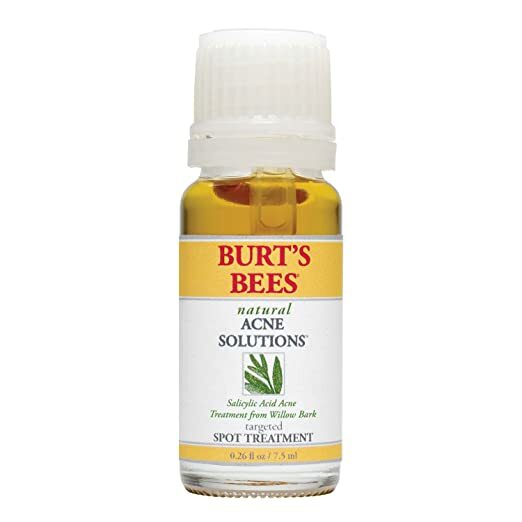 In case you are looking for a quick fix for your acne, then Burt’s Bees Natural Acne Solutions Targeted Spot Treatment might be able to help you. This product contains natural acne solution to reduce the appearance of blemishes in just 48 hours. The product is a formulation of salicylic acid, tea tree and calendula to reduce inflamed lesions. It also has parsley extract to soothe affected skin. People who gave this product a try liked that it doesn’t only address acne but it also improved their acne scars. They are also fond of the capability of the solution to quickly dry up pimples. To use the product, you only need a very small amount. You can see improvements even after just one application. One downside of the product, meanwhile, is its smell. A lot of users find its scent too strong not to notice. Packaging also isn’t that great as the applicator can’t seem to dispense the product really well. Because the solution is runny, we suggest using a Q-tip to make application a lot easier and less messy. Whether you like makeup or backpacking, keeping this product within easy reach can help you stay away from breakouts. These towelettes contain salicylic acid, tomatoes and witch hazel to address oil and dirt that can cause skin impurities. It effectively removes makeup, even waterproof mascaras, as well oil residues on your skin. Users with sensitive skin take this product as their daily face cleaner. Because it contains 97% natural ingredients and as low as 1% salicylic acid, it isn’t too agitating to the skin. As for the packaging, we particularly liked that it has a closable lid compared with other facial wipes that only relies on resealable stickers to remain intact. We also liked that it also doesn’t cause stinging even on the eye area. When using the towelettes, we suggest taking extra caution to avoid tugging or pulling the skin.You should also use it with gentle motion to avoid creating minute tears in your skin. A few people find the material too rough. There are also users who find its scent too unpleasant. PanOxyl bar contains 10% benzoyl peroxide. It’s a soap-free cleanser that can reduce excessive oil production. The product works well on both face and body. It’s even ideal for people who are struggling with back acne. If this is the first time you’re trying out the bar, it’s best if you can start using it once a day. This will help your skin adjust better with its drying effect. In case you are going outdoors, make sure to apply a good sunscreen as it can cause photosensitivity reactions. Aside from its drying effect, the bar can also cause a stinging or even burning sensation. Depending on your tolerance, this product may or may not work for you. Exfoliation is important for every skin type. However, for acne prone and oily skin, it’s best if you can exfoliate only once or twice a week to avoid triggering excessive oil production. Do not sleep with your makeup on. It will clog your pores and cause inflammation as a result. Because oily skin has overactive sebaceous glands, it can be quite tempting to skip moisturizers. Doing this, however, will only worsen your condition as the skin tends to produce more oil to compensate for its insufficient moisture. Frequently touching your face with your hands can also cause acne. Aside from the fact that your hands can harbor dirt, they can also spread bacteria to the rest of your face. Try to limit your dairy food and sugar intake as they can also cause acne. Get a good night sleep, preferably 6 hours per day. Without enough rest and sleep, your metabolism, stress level and even your hormones can fluctuate erratically. Choosing the right acne products can be confusing, particularly if you’re not aware of exactly what you’re looking for. To make sure you get your hands on only the best product, it’s essential that you read labels and ingredient lists. Benzoyl peroxide is one of the most common acne-fighting ingredients you’ll find. Its strength varies between 2 to 10%. It works by exfoliating the skin while removing excess oil. It also has a bactericidal property. Salicylic acid is another common ingredient you’ll find in anti-acne products. Similar to benzoyl peroxide, it can also exfoliate your pores. Because it’s closely related to aspirin, it also has an anti-inflammatory property. Tea tree oil is a natural acne solution. It has both antibacterial and anti-inflammatory properties to soothe and heal your breakouts. Alpha Hydroxy Acids, including glycolic acid, are considered effective exfoliants. Because they help shed off dead skin cells, they are helpful in preventing your pores from getting clogged. Sulfur is another potent acne solution. However, because of its smell, it’s not commonly used solely in acne products. You can find a few products that mix sulfur with another ingredient to mask the smell. This mineral helps tone down excess oil production while providing good exfoliation. Although the products on this list are guaranteed to help you address your acne problems, we feel that St. Ives Apricot Scrub, Blemish Control deserves our top spot. We like that the product, aside from its salicylic acid, also contains apricots to provide your skin a good antioxidant source. We also like that instead of microbeads, it has crushed walnut shells as scrubs. If you have highly sensitive skin, then this product may not be right for you as its scrubs can be a bit tough on fragile skin. However, if you have redness on your face or you simply want to prevent future breakouts, then we highly suggest you take a closer look at this product. The Surprising Truth: Does Drinking Water Help Clear Acne?